I just love weddings! Regardless of how well I know the bride and groom, I love to attend weddings. Partly because it reminds me of my own wedding weekend and how much fun we had with friends and family. It’s such a special time in a couple’s life and being able to share that moment as a guest is so fun (yes, I’m the guest who always has a tissue in my clutch and have been known to hold my husband’s hand through the entire ceremony AND shed a few tears of joy throughout). You may be wondering what to wear for a summer wedding or soiree? Since, I always love any excuse to get dressed up and am giddy with excitement when we receive an invite in the mail for a special event, my mind immediately races to...what will I wear?!? What is the dress code? What shoes will I wear so I can dance the night away in comfort?. Whether you are standing next to me (giddy with excitement) or the exact opposite (stressing about what to wear! ), I’ve got you covered. I am so excited to team up with a local boutique in Cleveland, Amy’s Shoes & Apparel to bring you 5 ways you can be the best dressed guest at an upcoming wedding or summer event. All of the outfits featured can be purchased in-store at Amy’s Shoes & Apparel or online where the links are provided. Wear a Statement Dress. You never want to upstage the bride but I do think it is absolutely appropriate to wear a dress with bold colors and patterns, particularly if it’s an evening wedding or affair. I’m always a big fan of dressing it up a notch, regardless! If you choose a statement dress, I would let the dress do the talking and keep the shoes and jewelry neutral. I do, however, love the look of this chain link necklace. The color blends beautifully with the dress but definitely adds a little extra style. 2. Simple and Classic. You can’t go wrong with a simple black dress (yes, you can wear black to a wedding). Particularly, the fabric of this dress is lightweight, making it a perfect dress for a summer soiree. When wearing black, you can have a lot of fun with accessories. I kept it simple with a beaded necklace, but added a little glitz with these fabulous party shoes. 3. Floral Up-a-Notch. Floral prints are popping up everywhere! I love this dress with an all-over floral pattern for two reasons. 1) The ruching on the side and a more structured fabric gives this dress a super flattering fit. 2) An all-over print can distract the eye and hide any trouble areas (not to mention any spills during the night!). Adding a monochrome necklace can help anchor and draw the eye upward. I would recommend keeping the shoes simple in one color but add a little style with fringe. 4. Wear a Statement Shoe. When putting together an outfit, I like to add one item that is worthy of remark. In this outfit, these shoes are definitely a showstopper...get ready, you will be taking compliments all night long! This dress can easily be dressed up or down, depending on the dress code. You also have the option to wear it off-the-shoulder or not. I was drawn to the beautiful fabric...this dress is a must-have even if you haven’t received the invite yet! So, don’t stress about what to wear to your next Summer wedding or event. 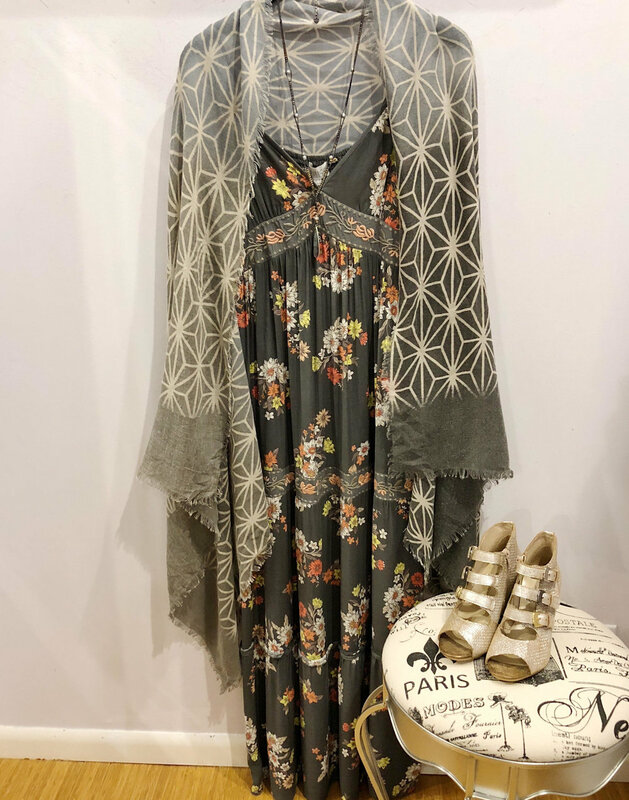 Visit Amy’s Shoes & Apparel for these fabulous outfits and so much more! If you’d like even more help creating a custom look that matches your style, shape, and lifestyle, I’m here to help! Click here to learn more about my Special Occasion + Event Styling Package. Amy’s Shoes & Apparel has 2 locations in Cleveland - Rocky River and Eaton Chagrin Boulevard. This boutique carries an amazing assortment of brands that you wouldn’t typically find in a departments store or chain store. It is a one-stop-shop with styles that work well for ages 20 and beyond. What sets this boutique apart is the amazing customer service you receive from every store associate the minute you walk in the door! They are ready to help and ensure you look and feel your best! If you are not in the Cleveland area, you can shop online or they are happy to ship any item that you see on their Instagram and Facebook pages.